There are three weeks left before the special runoff election in the sixth congressional district of Georgia, likely the last chance Democrats will have in this off-year to pick up a House seat and strike terror in the hearts of Republicans about their odds of doing well in the 2018 midterms. 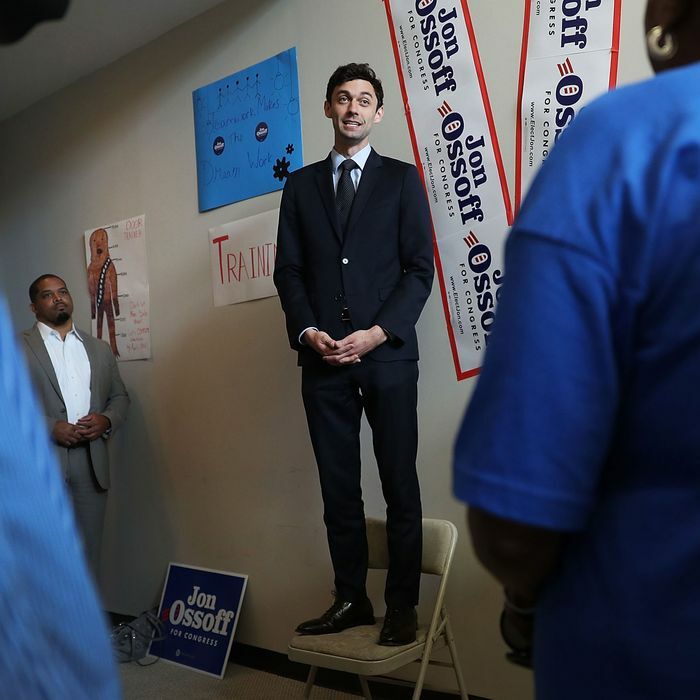 It is now reasonably clear that unlike the Democratic candidates in previous 2017 special elections in Kansas and Montana, Democrat Jon Ossoff is not going to face the voters suffering from a big financial disadvantage. The contest, by far the most expensive U.S. House race in the nation’s history, has now cost more than $36 million overall. That includes about $21 million spent or reserved for advertising since April 18, when Republican Karen Handel and Democrat Jon Ossoff notched spots in the June 20 runoff. Of that $21 million in runoff ad spending, roughly $11 million is from Team Ossoff and $10 million from Team Handel. But that doesn’t tell the whole story. More than $7 million in Democratic runoff spending is from the candidate’s campaign, thanks to his wildly successful online fundraising efforts, with another $3.6 million coming from the national House party committee and $250,000 coming from a pro-Democratic PAC. Karen Handel’s campaign only accounts for $1.7 million in ad spending, with the bulk of her buys coming from the House party committee ($4.1 million), Paul Ryan’s Congressional Leadership Fund ($2.8 million), and the U.S. Chamber of Commerce ($1 million). Because campaigns are guaranteed significantly lower ad rates than noncandidate buyers, Handel’s reliance on outside groups means a lot less bang for the buck, and fewer ads than Ossoff. With ads running at saturation levels dating back to April, this may not matter as much as the robust investments both sides are making in direct voter contacts and other get-out-the-vote efforts. But if Ossoff loses, no one is going to be able to say it was because he got outgunned financially. Right now the race still looks like a toss-up. Only two public polls have been taken since the first round of voting in April. Gravis had Ossoff up 47/45 as of May 10. A Survey USA poll a week later showed the Democrat leading 51/44. But polling for special elections is notoriously shaky. And there’s a reason Team Ossoff really wanted to avoid a runoff: The demographics obviously favor the GOP in this district they have held for decades, particularly in low-turnout contests, of which a special-election runoff is usually the epitome. Handel hasn’t made any obvious mistakes in the runoff campaign, and Republicans have united behind her smoothly. Yes, the “Pelosi-Ossoff” ads attacking San Francisco that the GOP has run with insane redundancy are in danger of backfiring, but they do have the merit of constantly reminding anti-Trump Republican voters that Ossoff is a Democrat. But he’s a Democrat who will either soon be heading to Congress, or will simply be a fundraising legend, perhaps for years to come.